Large, elongated fish with a large mouth. Upper jaw reaches to or slightly beyond the rear margin of the eye in adults. Green with dark horizontal stripe. Upper parts are greenish with darker mottlings; the lower sides and belly are whitish with dark spots arranged in streaks. The midside has a broad, dark continuous stripe. Cheek scales much smaller than rest of body scales. Tongue has rough patch. Total length: 10 to 17 inches; weight: 1/2 to 3 1/2 pounds; maximum about 20 inches and 4 to 5 pounds. Permanent-flowing waters that are warmer and slightly more turbid than those where the smallmouth bass occurs. Main channels of large rivers and in most Ozark reservoirs at greater depths than other black basses. Most active at dawn and dusk. Carnivorous, feeding on crayfish, fish, and immature aquatic insects. Bass often catch their prey by ambushing from a place of hiding. Suction created when the rather large mouth is suddenly opened helps them capture prey. 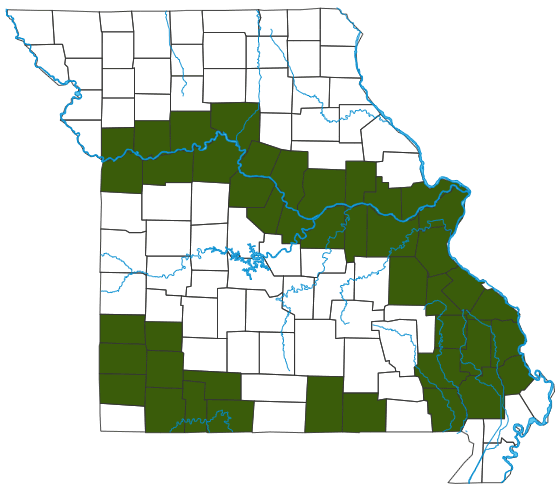 Species has 2 distribution centers in Missouri: lowland ditches and larger streams of southeast Ozarks, and the western periphery of the Ozarks, including parts of the White, Spring, and Missouri river systems. Individuals can live for about six years. Most closely related to largemouth and smallmouth bass, spotted bass is an important game fish in Missouri's larger streams and reservoirs, although it is less desirable because of its smaller size. Fishing methods are similar to those for taking largemouths and smallmouths. Introduced populations of spotted bass tend to replace the smallmouth through hybridization and competition.